These hot cross buns are delicious and much better than store bought, plus they’re fun to make so get baking! Bring the milk to the boil, then remove from the heat and add the butter. Leave to cool until it reaches hand temperature. Put the bread flour, caster sugar, salt and yeast into a bowl and make a well in the centre pour in the warm milk and butter mixture, then add the beaten egg. Using a wooden spoon, mix well and bring everything together with your hands until you have a sticky dough. If you have a Kitchen Aid or stand mixer, using a dough hook on a low speed bring everything together (this should take about 5 minutes). If you do it by hand knead on a floured surface for 5 minutes until it's smooth and elastic. Once you have kneaded the dough put it into a lightly oiled bowl and cover with oiled cling film. Leave to rise for one hour in a warm place until doubled in size. With the dough still in the bowl, tip in the raisins, mixed peel, zest of one orange and the cinnamon. Knead into the dough making sure everything is well distributed. Leave to rise for one hour or more until doubled in size, again cover with oiled cling film. Divide the dough into 15 even pieces. Roll each piece into a smooth ball on a lightly floured surface. Arrange the buns on one or two baking trays lined with baking paper. Leaving enough space for the dough to expand. Cover but don't wrap with more oiled cling film. Set aside to prove for one hour more. Preheat the oven to 180°C / fan 160°C / gas 4. For the crosses, mix the plain flour and milk until you have a thickish paste. Spoon into a piping bag with a small round ended nozzle. 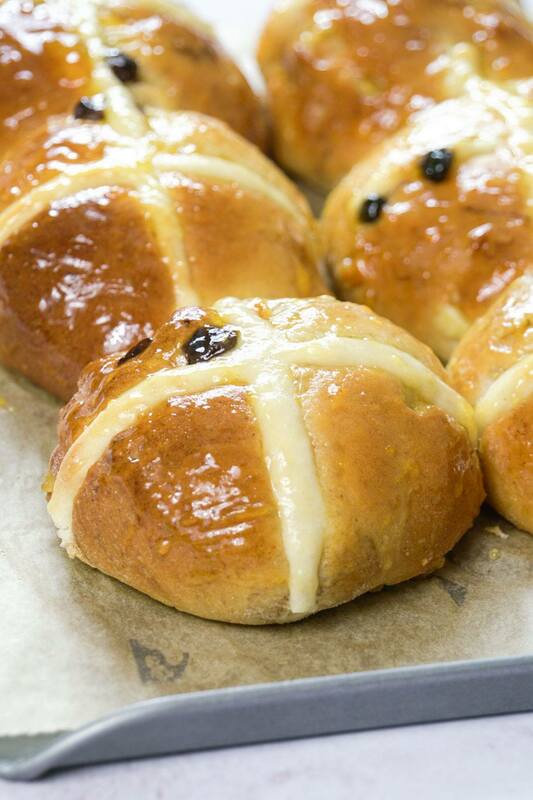 Pipe a line along each row of buns then repeat in the other direction to create crosses. Bake for 15 minutes or until golden brown. Gently heat the apricot jam to melt, while the jam is still warm, brush over the top of the warm buns and leave to cool. Enjoy plain with some butter or we preferred ours slightly toasted with butter or maybe jam/marmalade.